Marijuana, commonly known as weed, is a drug derived from the cannabis plant for the mind-altering effects produced by THC. According to the National Institute on Drug Abuse (NIDA), weed is the most commonly used illegal drug in the US. More than 11 million people, ages 18 to 25, reported using marijuana in 2015. It is the most commonly used psychoactive substance around the world. When too much weed is consumed at a given time, people can experience hallucinations, delusions, and even psychosis. The effects of weed usually set in after 30 minutes to one hour of ingesting it and can last for a few hours at a time. NIDA explains that long-term term negative effects of chronic marijuana use are a concern. Particularly when used by teenagers, weed can impair thinking, memory, and important learning functions that form connections in the brain. 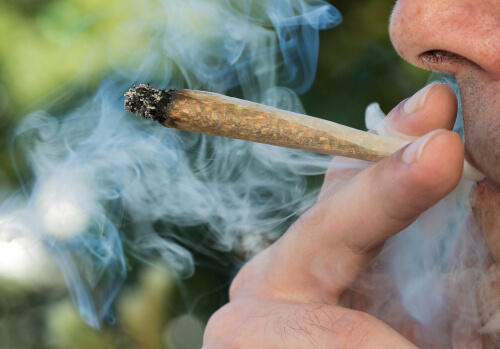 Researchers are still trying to understand if any sustained long-term damage is caused by marijuana misuse, but they have already observed examples of lowered I Q in adults who used weed since they were young. Addiction to weed is possible. NIDA explains that the THC level in marijuana has increased over the past few decades, making it easier to become addicted to the drug and experience adverse side effects from use. There are both physical and psychological side effects caused by using weed. Physical symptoms may include breathing problems, increased heart rate, nausea, and vomiting. Psychologically, people who use marijuana for an extended period of time are at risk for hallucinations, paranoia, disorganized thinking, depression, anxiety, and suicidal ideation. It is also dangerous for women to use marijuana while pregnant. Marijuana use by pregnant women has been linked to low birth weight as well as brain and behavioral problems in the baby. While a life-threatening overdose of marijuana has never been reported, it is possible to overdose to the level of experiencing extreme symptoms, such as anxiety and paranoia. People occasionally end up in an emergency room when they have a psychotic reaction to marijuana. Likewise, extreme dizziness that leads to nausea and vomiting can causes people to seek medical treatment. According to NIDA, 9–30 percent of marijuana users develop some level of dependence on the drug. People who begin using the drug before the age of 18 are up to seven times more likely to develop an addiction to weed than people who first start using it as adults. Marijuana Anonymous (MA) reports that insomnia is the most common withdrawal symptom experienced by its members. It varies from person to person, but the possible duration of sleepless nights can last anywhere from a couple of days to a few months, depending on the duration and severity of the drug use. Following insomnia, MA has found that depression is the next most common withdrawal symptom, followed by nightmares and vivid dreams. In addition to the above symptoms, people can also feel varying degrees of anger when detoxing. People may experience a constant low-level of anger and rage, general irritability, or sudden outbursts of anger. The anger can be directed at themselves, close family and friends, or the world in general. There are currently no medical treatments available to support someone detoxing from weed, though there are many detox programs out there that can treat individual symptoms and provide support. Behavioral interventions and personal therapy have been successful in helping those trying to get and stay sober. In an outpatient or inpatient detox program, medical professionals can provide medications to treat withdrawal symptoms, such as nausea or headaches, in order to aid the detox process. Doctors may also recommend patients gradually taper off their weed use in hopes of making withdrawal symptoms less severe. According to a 2012 study, no medications had been shown to effectively treat marijuana addiction and no medications had yet been approved for use by the Food and Drug Administration. Medications that were being effectively used were only designed to alleviate withdrawal symptoms. This indicated a need for the development of marijuana addiction treatment specific drugs. As of the time of this report, the number of marijuana users continued to increase while the majority of the individuals seeking treatment for a marijuana addiction exhibited significant difficulty staying sober. The greatest risk of detoxing from weed on your own is relapse. Withdrawal symptoms can be uncomfortable, and without a strong support network in place, the urge to use more weed can be overwhelming. When you choose to detox in a treatment facility, you have the support of peers and healthcare professionals to see you through this difficult transition period. Fortunately, the physical risks of detoxing from weed are not extreme. Dehydration, nausea, and vomiting are the greatest symptoms to be aware of. Taking extra precautions to keep yourself hydrated or having a close friend nearby to monitor these physical symptoms are good safeguards to have in place. In addition to weathering the physical symptoms of withdrawal, many people experience a psychological adjustment to becoming sober. Oftentimes, feelings of anxiety and depression can present following physical detox. When detoxing by yourself at home, it can be difficult to try and navigate these feelings. At a comprehensive treatment facility, mental health professionals can help you address these feelings in a healing and constructive manner. Because detoxing is a physically and emotionally challenging time for most people, it is important to have many supports in place. MA offers a number of tips and healthy habits to help ease the detox process. Drink lots of water and clear liquids. Take hot baths to soothe physical pains and for mental relaxation. Greatly reduce or eliminate caffeine until anxiety and irregular sleep patterns are gone. Exercise regularly to improve mood and physical health. Following physical detox from weed, programs like MA offer continuing long-term support in the form of sympathetic and nonjudgmental support groups. Becoming part of a healthy and supportive community can be a motivating and essential component of maintaining sobriety. For people trying to detox on their own, it is important to establish a healthy living environment and be aware of triggers you might encounter that would make you want to use weed again. Rid your home of any drug paraphernalia, and avoid people and places you associate with use of the drug. Additionally, you must stop thinking about yourself as a marijuana user and have confidence that you can maintain sobriety. Share your new goals with trusted family and friends so you have people who are ready and willing to support your sustained sobriety.